Combine coffee grounds and water in glass container. Cover and steep at room temperature for 12 to 18 hours. Carefully strain mixture through fine mesh strainer, cheese cloth or coffee filters into large container or pitcher. 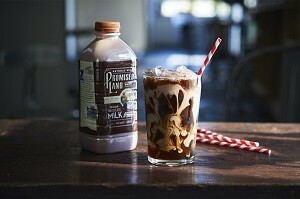 Add Promised Land Dairy Midnight Chocolate Milk to cold brewed coffee. Cover and store in refrigerator. Shake well; serve over ice.